New York : Harper & Row, 1985, ©1984. 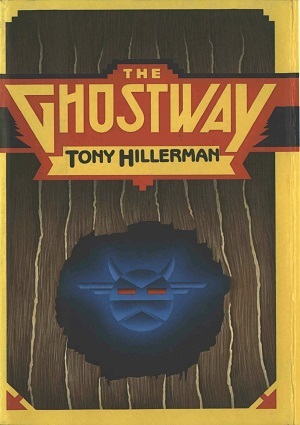 This is the first edition of The Ghostway. The sixth book in Tony Hillerman's Navajo Mystery Series and the third novel featuring the protagonist Sergeant Jim Chee of the Navajo Tribal Police. The book is designed by Linda Dingler with the dust jacket designed by David Myers. Format: Hardback, 21.9 x 14.5 cm. Binding: Brownish orange boards with deep blue cloth spine lettered in copper: [vertically] THE GHOSTWAY [decorative device] Tony Hillerman | [horizontally] HARPER & ROW. Publisher's device is stamped on the lower right front cover. Illustrated paper dust jacket, multicolored. Jacket design by David Myers.